From left, Kate, Duchess of Cambridge, and Prince Philip, Meghan Markle, and Prince Harry arrive to the traditional Christmas Days service, at St. Mary Magdalene Church in Sandringham, Dec. 25, 2017. Queen Elizabeth II and senior members of the British royal family, along with newcomer Meghan Markle, an American actress engaged to Prince Harry attended a Christmas church service on Monday as a crowd of local residents gathered. 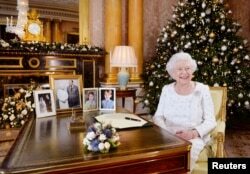 Britain's Queen Elizabeth sits at a desk in the 1844 Room after recording her Christmas Day broadcast to the Commonwealth, in Buckingham Palace, in this undated photograph received in London, Dec. 24, 2017.